1 of 3 Trim mushrooms. Place in food processor with scallion. Pulse until finely chopped. Scrape into bowl; combine with beef, bread crumbs, Worcestershire sauce, salt and pepper. Shape into four patties. 2 of 3 Heat a large nonstick skillet over medium-high heat. Add burgers and cover with a sheet of foil. Cook 6 minutes. Uncover burgers and flip over. Cover; cook 5 more minutes. 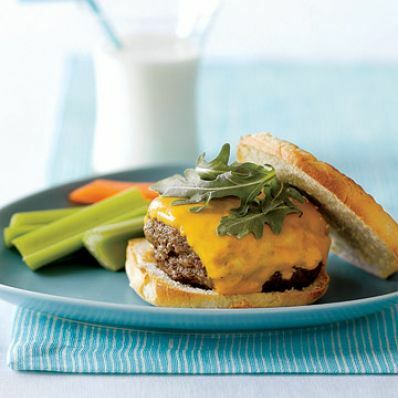 Uncover pan and top burgers with cheese. Cook 1 minute until cheese is melted and burgers register 160 F on an instant-read thermometer. 3 of 3 Transfer burgers to toasted muffins and top with arugula. Serve with carrot and celery sticks. 1 of 1 If desired, cut calories and up fiber by purchasing one of the new brands of lower-calorie whole-wheat muffins.